The Isle of May’s Plastic Horror Show – Neptune 911! Heart-breaking documentary footage of a dead whale calf has prompted a reminder that plastic pollution is a killer round shores close to home. The manager of a nature reserve in the Firth of Forth warned that the scourge highlighted by BBC’s Blue Planet II was a growing problem and that birds on the Isle of May regularly fell foul. David Steel also published photographs of entangled seabirds, including a guillemot with a balloon wrapped round its leg which he rescued from certain death. Viewers of the hit television series narrated by Sir David Attenborough reacted with horror to footage on Sunday of a whale carrying her dead newborn calf, and vowed to stop using plastic bags and disposable straws. David Steel, manager of the Scottish Natural Heritage reserve south of Anstruther, stressed that the scourge killing marine life was not confined to the largest oceans and deepest seas. He said: “Just take a walk along your nearest beach and you’ll find evidence of plastics, from cotton buds to bottles and polystyrene bits. 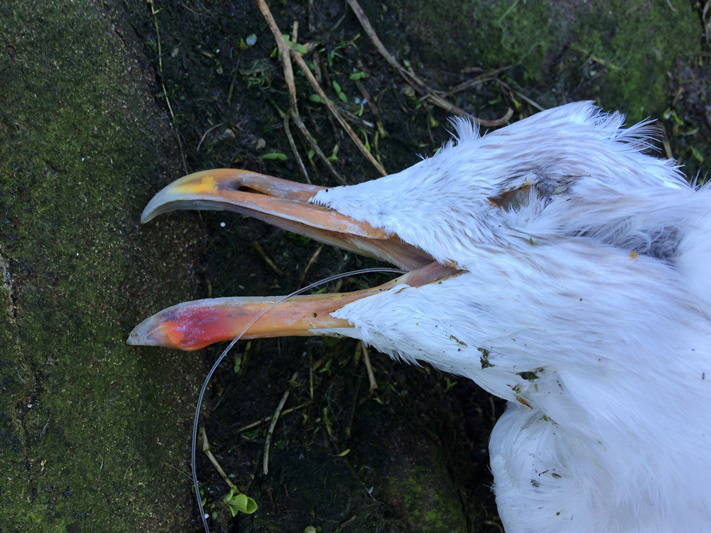 A dead bird on the Isle of May, thought to be one of the many victims of pollution. The Isle of May is home to huge colonies of seabirds, including puffins, guillemots and fulmars, and grey seals. Mr Steel said: “Even out here, six miles out in the North Sea, the Isle of May NNR doesn’t escape the increasing problem. “Every year we have various items washed up along the tideline and once removed, it is soon replaced on the next incoming tide. He said balloons, for example, were being found more and more on the island. “The impact can be devastating, from birds being spooked off nests and contents lost, to entanglement and death. However, he said awareness of the problem was rising and action being taken, such as reducing plastic bag use in supermarkets, was positive. The latest episode of Blue Planet II also showed turtles trapped in floating debris and told how plastic breaks down into micro-particles consumed by sea creatures. Around eight million tonnes of plastic ends up oceans each year. Experts estimate plastic is ingested by 31 species of marine mammals and over 100 species of sea birds.